'Welcome To Canada': Syrian Refugees Begin To Arrive : The Two-Way The new Canadian government wants to resettle 25,000 Syrians by the end of February. Most are currently living in refugee camps in Jordan, Lebanon and Turkey. "You're in Canada now, with all the rights and protections and possibilities that confers. "You'll find the place a little bigger than Damascus or Aleppo, and a whole lot chillier. But friendly for all that. We're a city that cherishes its diversity — it's our strength. Canadians have been watching your country being torn apart, and know that you've been through a terrifying, heartbreaking nightmare. But that is behind you now. And we're eager to help you get a fresh start." The pledge to bring in the refugees was part of a campaign promise by Canada's new prime minister, Justin Trudeau. That promise helped sweep him to power in October's election. Initially, the government wanted to bring in all 25,000 Syrian refugees by the end of this year. That ambitious plan had to be scaled back because of the sheer scale and speed of the operation. Syrian refugees wait at Marka Airport in Amman, Jordan, this week to complete their migration procedures to Canada. Instead, 10,000 Syrians are now due in Canada by the end of this month. Most of them are being sponsored by private groups and citizens. Canada is the only country that allows the private sponsorship of refugees — it's mandated in the country's immigration law. Sponsors must commit to being responsible for the refugee for one year. It requires providing financial help during that time — about $24,000 US — and help finding housing, employment and schools for children. The Canadian government will provide health care, travel expenses and language classes. Applications to sponsor Syrian refugees have been pouring in since early September, when a photo appeared of a lifeless 3-year-old boy whose body had been swept ashore at a Turkish beach. Alan Kurdi's parents had applied to Canada for asylum, but the request was turned down. Resettlement workers say most Canadians have embraced the idea of bringing in the Syrians. Churches, universities and whole communities have been pitching in to raise money and find housing and employment for the refugees. But the terror attacks in Paris and San Bernardino have led to questions about whether there is a security risk because the government is moving so quickly. All the Syrians to be resettled in Canada will have been chosen by the United Nations High Commissioner for Refugees. Most are currently living in refugee camps in Jordan, Lebanon and Turkey. 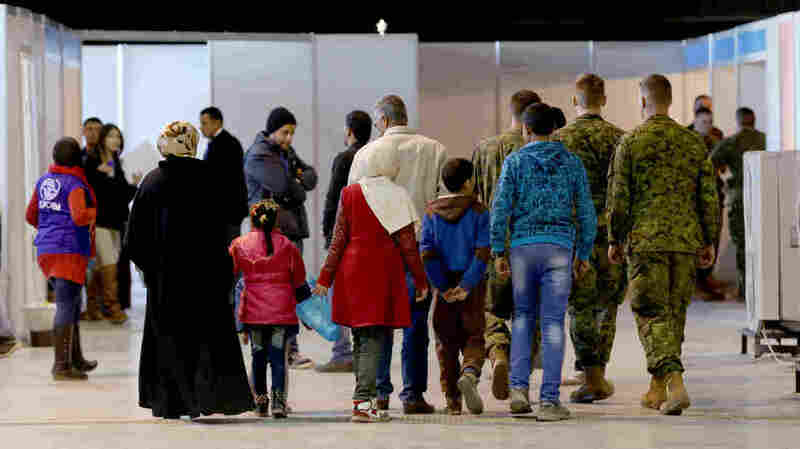 The refugees will go through various levels of screening, including by Canadian immigration and security officials, before getting on a plane to Canada. Most of the refugees will be women, children, elderly people, families and those with injuries or medical conditions. Canadian officials say unaccompanied young men will have to wait, for now.